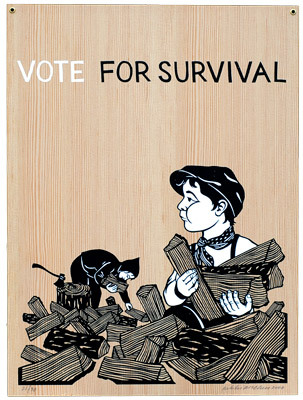 Urging people to vote with posters is not a new thing, but urging people to vote with limited edition silk-screened wood boards does seem a little more unique. Olympia artist Nikki McClure‘s artwork will be showcased on the traveling train art tour, Vote For Survival. On October 10th, they will have a reception at the wonderfully indie San Francisco zine shop, Needles & Pens. From October 18th to November 12th, the tour will be at the famous Giant Robot shop in Los Angeles. But best of all, for all of those individuals who will not be in California, Olympia shop BuyOlympia will have four of the prints available for purchase on their website. Each print is signed and numbered by Nikki McClure, and the 1/4″ thick Fir boards are printed with thick, rich inks. With eyelets in the top two corners of the boards, they are easy to hang and display without framing, and, at 30 limited edition copies per piece, the pieces will be original artworks owned by few other individuals.